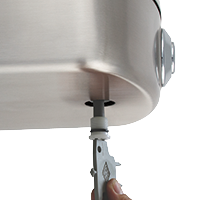 This combination unit includes a Barrier-Free, Rounded Box Drinking Fountain with a round vandal resistant pushbutton. It also includes a recessed sensor activated bottle filler. An in-wall chiller assembly is supplied to provide 8 gallons (30.3 liters) per hour refrigeration for both the drinking fountain and bottle filler. A mounting frame with a 21 inch (53.3 cm) wide louvered trim panel is provided.